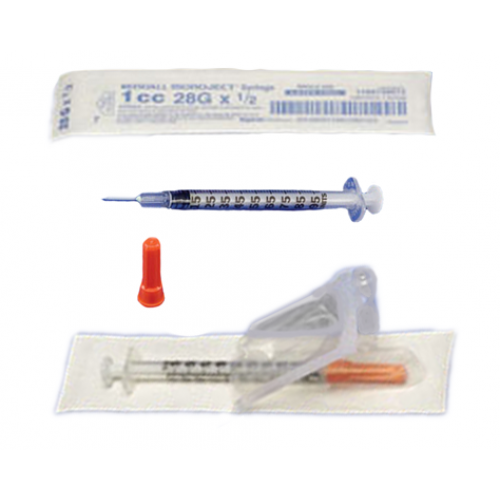 Monoject Insulin Syringes with Needles are SoftPacked for easy convenience and ease of use. Manufactured by Kendall, a division of Covidien, SoftPack Insulin Syringes are designed for Diabetes patients. These Insulin Syringes come with an Accu-tip Plunger Tip, Accu-Scale graduations and a clear barrel construction with bold scale for easier reading and accurate measurements. Kendall Insulin Syringes and Needles are soft packed in a one step peel away package that facilitates quick and easy opening for aseptic handling. Attached Ultra-Comfort Needles are lubricated for increased patient comfort and less pain. 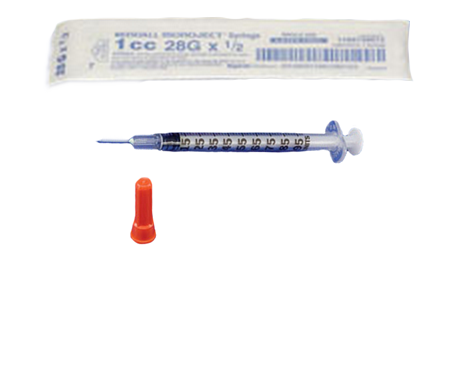 Syringe tip caps included on each syringe provide complete protection from contamination of sterile fluid pathway. 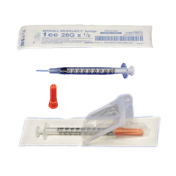 Vitality Medical also carries Rigid Pack Insulin Syringes with Needles. Electro polished stainless steel needle. U-100, U-50 and U-30 Insulin. 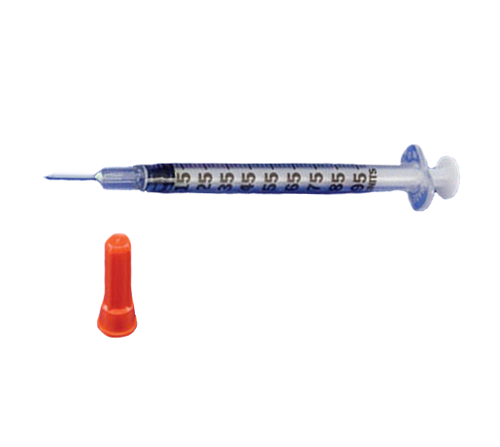 Syringe Volume Size: 0.3 mL, 0.5 mL, 1 mL or 1/3 cc, 1/2 cc 1 cc. Syringe Construction: Polypropylene barrel and plunger rod. Needle Gauge Options: 25 Gauge, 27 Gauge, 28 Gauge, 29 Gauge, 30 Gauge. Needle Length Options: 0.5 Inch, 5/16 Inch. Needle Attachment Options: Permanently Attached. Needle Point Style: Beveled Tip. Needle Wall Type: Regular Wall. 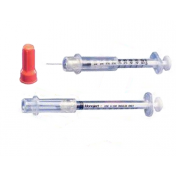 Monoject Softpack Insulin Syringes with Needle Product Numbers: 1188128012, 1188528012, 8881600004, 8881600145, 8881600350, 8881600700, 8881601101, 8881601358, 8881601600. Top quality products and speedy delivery. Great quality for the price and very quick shipping. Good to know i have these to rely on for my diabetes care, aside from regular exerchse and good diet of course. I have FINALLY found the right diabetic provider! Exceptionally fast shipping and customer service was *Fantastic!!!!! good quality product and timely shipping.. These syringes felt different from the others I have used, but after a few times, I got used to it and now I don;t even remember how the others felt! And for the price, it was worth it. Great product. And fast shipping! Made my first order with Vitality. I was impressed. To start they have great prices. Two, it shipped super fast! Three, product was of excellent quality. Four, I think I have found my permanent medical supply provider! I have bounced around a lot over the years and now I think I have found the right one.